It’s official! We launched a brand-new, life giving church here in Omaha, Nebraska called My City Church!!! Here at My City, we truly feel like this is OUR TIME! This expression has such a significant meaning for our church. We believe God has called us specifically to Omaha to Love God, Love People and to Lead in Life. This is our time! Today was much more of a launch day celebration than it was the opening of a brand new church. The culmination of a lot of hard work, a lot of trusting God and whole lot of prayer! Today we were able to celebrate the launch of our church with over 700 people across 3 different services!! However, this is just the beginning and we feel a call to continue to pour life into this City. This is our time! It started early in the morning, about 50 people arrived to help setup around 6am as our Load in team. People going everywhere and doing everything to ensure setup was done with excellence, from staging, lighting, signage, children’s ministry and much, much more. Another 50 or so arrived around 7am, including the KETV news crew to capture some video and run through a few interviews! This is our time! Then team rally came, where really it was just a big thank you from our Pastors Jesse and Angela Norman. They did their usual on-stage flirting with one another, but then quickly transitioned into just remembering God had ordained this day a long time ago and we just had to go out and be available. Reminded us to never walk by a ministry moment on the way to do a job. Make sure we Love people. This is our time! By the time the first service was underway, we had problem but a good one to have: too many people! We were packing the place full, leaders had to give up their seats, people were sitting and standing in the hallway, but ultimately, Jesus led the way! We had somewhere around 370 people show up for service at 9:30am, this was amazing! This is our time! Pastor Jesse then spoke on revival. Jesus came to us to show us that He can bring us out of our past, walk with us in the present and give us vision for an abundant future! This is true revival: when we awake from chains that bind us down in life, we can experience true life change in Jesus. This is our time! Luke 4:18 says, “The Spirit of the Lord is on me, because He has anointed me to proclaim the good news to the poor. He has sent me to proclaim freedom for prisoners and recovery of sight for the blind, to set the oppressed free.” Love this passage of Scripture as Jesus is the one reading through an Old Testament verse in Isaiah, but the verse is actually referring to himself, Jesus. Jesus came! It was, is and always will be, the same message. He came to save the world, knowing we all go through life challenges, but he understood there is a battle to fight for, the fight for the hearts of people. Jesus won that battle and was victorious! This is our time! The momentum continued to permeate throughout the Thompson Alumni Center as the second service rolled around. The 11:15am service saw nearly 320 people in attendance and the energy was completely electric. The spirit was absolutely present and pouring into the hearts of people! It felt like there was an anointing on every single person in the room to experience revival! This is our time. While the attendance, the music and the preaching were exciting, and we were excellent in our responsibilities, we still understood there is a greater purpose behind My City Church. We want to see Jesus change lives. We saw 70 people accept Jesus as their Savior! Our prayer is for them to continue to grow in their relationship with Him! Not only that, but we want to get involved in their lives and connect with them to help them grow in their walk with Jesus! This is our time! We believe church should be enjoyed, not endured. We have fun, we’re a little louder than most, but the most important thing is, we believe Jesus is the name above all names and we feel it is our calling to lift Him up in our city. We are group of people, God’s Church, who come from all walks of life, we all go through different ups and downs, but here is what we know: God desires to have a personal relationship with you and we are beyond thrilled to be a part of God’s mission to pursue the hearts of those in this city! We are so excited to be officially here in Omaha! This is our time! This weekend CREW registration opens. There are 12 Crew to choose from. 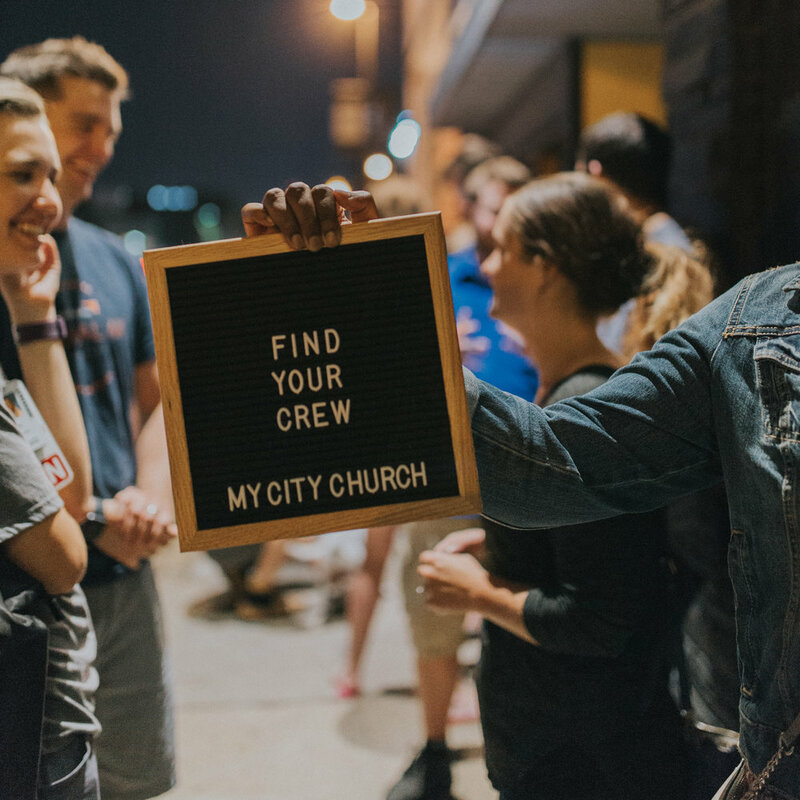 My City CREWS are small gatherings of 10-15 people who meet at different cafés and restaurants around Omaha to hang, eat, and talk about life. These gatherings take place on the 2nd & 4th weeks of the month. We would love for you to join us at any of our CREWS - simply check out the schedule, choose a crew, sign up online, and we will see you at dinner!